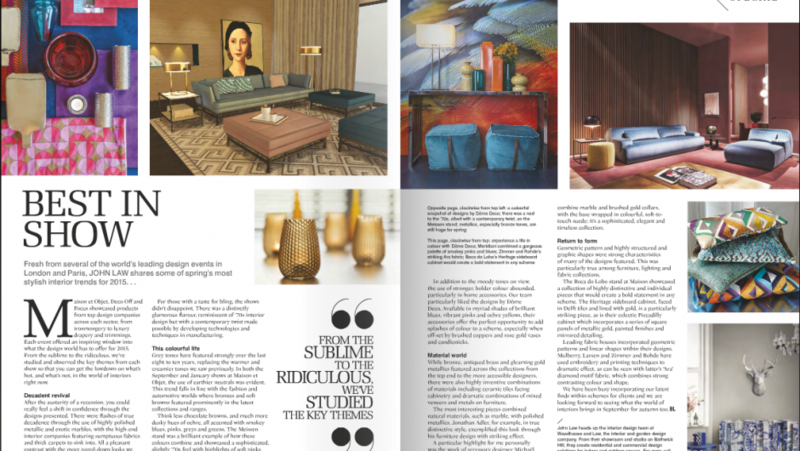 The interior design industry got off to a roaring start after the New Year celebrations with several of the world’s leading design events taking place in London and Paris. Maison et Objet, Deco Off and Focus showcased products from top design companies across each sector, from ironmongery to luxury drapery and trimmings. Each event offered an inspiring window on what the design world has to offer for 2015. From the sublime to the ridiculous, we have studied and observed the key themes from each show so that you can get the low down on what’s hot and what’s not in interiors this year. After the doom and groom of a recession, you could really feel a shift in confidence through the designs presented. There were flashes of true decadence through the use of highly polished metallic and exotic marbles, with the high-end interior companies featuring sumptuous fabrics and thick carpets to sink into. All a pleasant contrast with the more paired-down looks we have seen of late. For those with a taste for bling, the shows didn’t disappoint. There was a distinctly glamorous flavour, reminiscent of 70s interior design but with a contemporary twist made possible by developing technologies and techniques in manufacturing. Grey tones have featured strongly over the last eight to ten years, replacing the warmer and creamier tones we saw previously. In both the September and January shows at Maison et Objet, the use of earthier neutrals was evident. This trend falls inline with the fashion and automotive worlds where bronzes and soft browns featured prominently in the latest collections and ranges. Think less chocolate browns and much duskier hues of ochre. All accented with smokey blues, pinks, greys and greens. The Mesissen stand was a brilliant example of how these colours combine. A sophisticated, slightly seventies feel accented with soft pinks and blues. Then contrasted with striking and highly polished gold lamps bases. In addition to the moody tones on view, the use of stronger, bolder colour abounded, particularly in home accessories. Our team particularly liked the designs by Dome Déco. Available in a myriad of brilliant blues, vibrant pinks and ochre yellow, their accessories offer the prefect opportunity to add splashes of colour to a scheme. All off-set by brushed coppers and rose gold vases and candles sticks. Bronze, antique brass and highly polished gold metallics featured across the collections from both high-end and more accessible designers. Together with highly inventive combinations of materials including ceramic tiles facing cabinetry and dramatic combinations of mixed veneers and metals on furniture. The most interesting pieces combined natural materials such as marble, with highly polished metallics. Jonathan Adler, for example, in his distinctive style exemplified this look through his furniture design with striking effect. A particular highlight for me personally was the work of accessory designer Michaël Verheyden. The beautifully crafted vessels combine marble and brushed gold collars, with the base wrapped in colourful, soft to touch suede. A sophisticated, elegant and timeless collection. Geometric pattern and highly structured and graphic shapes were strong characteristics of many of the designs featured. Particularly amongst furniture, lighting and fabric collections. The Boca do Lobo stand at Maison showcased a collection of highly distinctive and individual pieces that would create a bold statement in any scheme. The Heritage sideboard cabinet, faced in Delft tiles and lined with gold, is a particularly striking piece, as is the Piccadilly Eclectic cabinet incorporating a series of square panels of metallic gold, painted finishes and mirrored detailing. The Symphony cabinet continued the theme, made up of a series of gold cylinders connected to create the form of the piece. The strong, clean lines creating striking texture and depth. Leading fabric houses incorporated geometric patterns and linear shapes within their designs. Mulberry, Larsen and Zimmer and Rohde use embroidery and printing techniques to dramatic effect. Zimmer and Rohde’s Ara fabric diamond motif is the perfect example, combining strong use of contrasting colour and shape. We have been busy incorporating our latest finds within schemes for clients and we are looking forward to seeing what the world of interiors brings in September for Autumn too. Next article Introducing our new team members!